I absolutely love handmade flowers and since I am still in the tortuous route of moving and downsizing my craft room I have found I far too many flowers in various stages of completion. The Less is More theme for week 129 is handmade flowers. 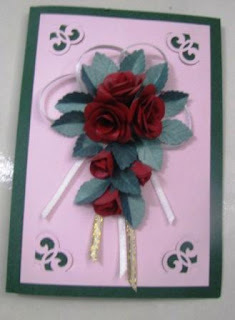 I just knew that I would pull out some card supplies and put some of my lovely flowers onto cards. It was all the encouragement I needed to rejoin the card making fraternity. This delightful red roses bouquet has been created by punching various heart shapes and curling them. The initial inside buds were created by first cutting the hearts in half and gluing it into a cone shape, then I have added more and more hearts with the tips curled out for extra dimensions. The leaves are simply punched and then using a scorer to score the veins. A little ribbon is looped and it is finished by layering the bouquet onto a top layer that has the corners punched before layering onto a base of dark green card. It has been far too long since I have made a card and certainly since I have posted anything crafty on this blog. I am going to go and make some more. Come back soon. Hola Michelle, thank you for your comment :D.
This bouquet is really gorgeous, your design remind me the bouquet for a wedding, great idea. Very interesting the Ezy Spacers, i would like to have one of these sticks, i don´t like make layers because is so boring :D.
A warm hug from Palma de Mallorca and i hope to see you soon.